This is another stop on a new slate of reviews I'll be posting on Nikki-Michelle's Spot. Before I ever had dreams of becoming a writer, I was a reader. That hasn't changed. I love to read. A good book can always take me away like Calgon. Next up, Angelborn by L. Penelope. I should note that this book is NOT on Kindle Unlimited. As a reader, I'm a fan of Kindle Unlimited. If you're a reader looking to test a new author, KU is a good investment, especially in this market of....eh, that's a story for a different day. Back to Angelborn. Wow! Angelborn was a breath of fresh air. Since the passing of L.A. Banks, I've been hard pressed to find speculative fiction by AA authors that captured my attention the way Mama Banks once did. Besides the greats, like Octavia Butler, I was trying to find new authors and happened to stumble across the name L. Penelope. She had two books on Amazon. 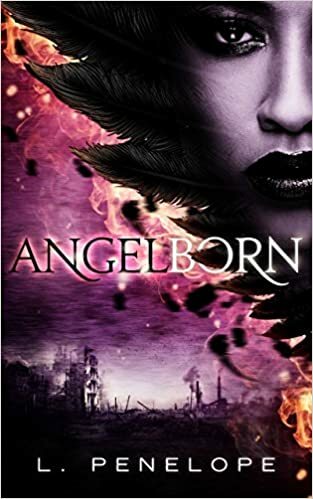 After reading each synopsis, I decided on Angelborn and boy am I glad I did. So let's get into it. In the beginning, we meet Caleb who is trying to escape to safety with the love of his life, Viv. We immediately find out that Caleb is more than human. Needless to say, trying to save himself and Viv didn't go as planned and he ends up in the Wasteland. Caleb starts his day out like he does every day, being that he has been cast into something akin to a world between worlds where lost human souls go to roam and Angelborn like him, those who couldn't get their human soul mate to bind to their souls. Next we meet Maia, whom I take an immediate liking to. Maia has a special ability. She sees dead people. When we meet Maia, she's talking to Ms. Sadie. Ms. Sadie turns out to be a ghost, one of the good ones and trust me, Maia meets quite a few bad ones along the way. Maia and Caleb meet via happenstance. Caleb's first love Viv, has been reborn as Maia's roommate. From there let the sparks fly! I absolutely loved how L. Penelope developed this story. Even though it was a novella, I felt it was a full novel. That's just how well L. Penelope developed her characters. I found it admirable that Maia tried to deny her attraction to Caleb out of respect for Genna, her roommate. But I have to mention Helix. I don't know why I loved when he came in a shook up crazy. LOL! Helix is a bad boy personified, but I'd be on his team for sure! However, I loved the way Caleb basically came through like nah, son, Maia's mine so back off. LOL. Well he didn't really say that, but you know. In the end, I appreciated a speculative fiction novel that had two AA leads. I've been pulling my hair out trying to find a good one and L. Penelope delivered. Her novella wasn't chocked full of fifty-leven characters which I loved. I give Angelborn 5 pages (think 5-stars). Nikki-Michelle recommends this book.